Dr. Joshua Landy is a Canadian critical care specialist, having completed his M.D. at the University of Western Ontario, his internal medicine residency at the University of Alberta, and his critical care fellowship at the University of Toronto. In 2013, Joshua co-founded a venture capital funded mobile health startup called Figure 1, a free-access repository of medical images available to the medical community. Figure 1 is currently available as a free download for Apple or Android users and has over 150,000 users in 100 countries. What inspired you to develop Figure 1? As a critical care specialist who works with a large team, I have seen how common it is to use one’s mobile phone to capture an image and send it to others for consultation and discussion. Most people do this because it’s faster and more efficient. One downside of this tactic is that it often doesn’t take into account patient privacy – the images have a patient’s information on them. I saw the opportunity to create a privacy-conscious archive of these teachable images and to allow discussions to happen around them. I thought it could be an incredibly valuable resource for healthcare professionals to have access to. How did you meet your two co-founders? I’ve been friends with Gregory Levey (Figure 1’s CEO) for years, and he introduced me to his friend Richard Penner (Figure 1’s CTO) over dinner one night. The three of us talked about the idea for Figure 1, and we felt like we could build the product and the company together. After a few weeks and a few legal bills, we had founded a startup. 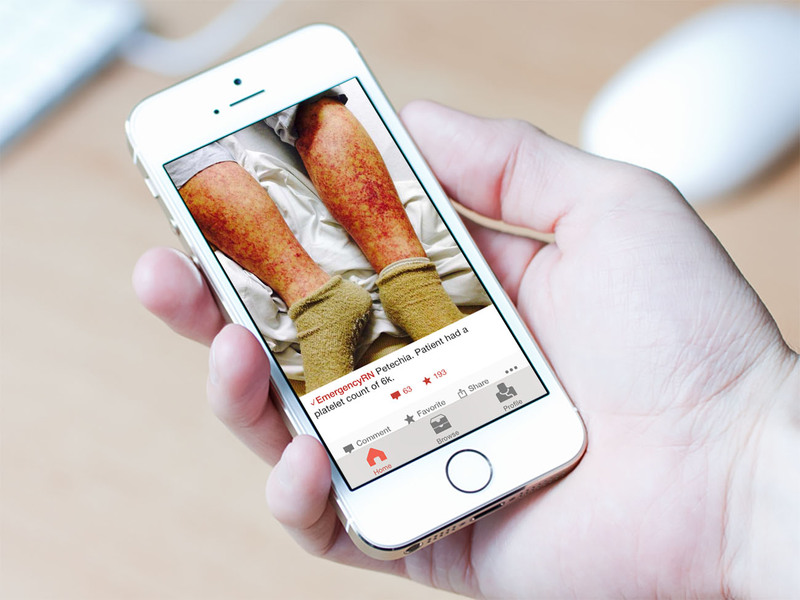 The Figure 1 app is intuitive to use and lets you organise your image uploads according to medical specialty. What is your particular role, and how valuable is your medical background? I’m the Chief Medical Officer here at Figure 1. My role is to advise on what healthcare professionals want and need in their workflow. I guide Figure 1 in any area of the company that touches medicine. In our case, that’s a long list, so I would say that launching a mobile health startup would not have been possible without one of us having worked in the field. 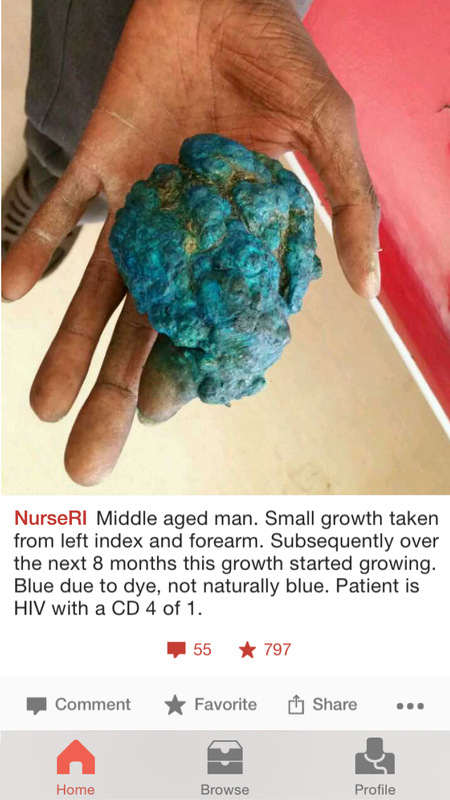 Each image is accompanied by your own description helping build a truly fascinating index of cases, such as this growth excised from the left forearm of an HIV positive patient with a CD4 count of 1. Are you still practicing clinical medicine? Yes, continuing to practice medicine is very important to me, both personally and professionally. I practice two weeks per month, so I essentially split my time between Figure 1 and the hospital. Do you think it is important for Figure 1 that you still practice? Working side by side with an interdisciplinary team in the hospital, I learn how my colleagues work and what tools might be developed to help them. I definitely think that’s beneficial for Figure 1. Will you have to work on Figure 1 full-time at some point? At this point, I don’t have a plan to do that because working with patients is important to me, and it provides an important dimension to my role as Chief Medical Officer. Why did you choose the VC investors that you did, and what value do your VC investors bring to Figure 1? We are very lucky to have world-class investors, based in New York, Boston, and Canada. Union Square Ventures led our Series A round of investment last year. They were early investors in Twitter, Tumblr, Etsy, and Kickstarter – they bring a wealth of knowledge from their pooled experience, and we tap into it regularly. How often do you meet your VC funders, and how deeply are they involved with the business? We conduct quarterly board meetings where we discuss high-level business strategy, but we also speak to them about smaller issues fairly frequently. While they have left running the company in our hands, their advice is incredibly valuable. What long-term potential do your investors envisage? I can’t speak for them, but I believe they see the potential for us to become an invaluable resource for every healthcare professional in the world. What advice do you have for doctorpreneurs seeking out VC funding? Remember: the relationships you develop with your investors are long-term relationships, and you should approach them as such. It’s best to take time to develop a rapport and ensure that your values and goals align. Anyone who joins your board of directors will get to know you well over time and vice versa. Make sure you are choosing people who you deem to be knowledgeable, trustworthy, and friendly. 150,000 users, 3 million views day and used by 40% of medical students in North America– how did you manage such penetration? Much of our growth has been driven by word of mouth. We’re very lucky to have users who tell their friends and colleagues about Figure 1, and do other kind things – like give us favorable reviews on the App Store. All of this helps with getting new people interested. We’ve also been lucky to get a fair bit of media coverage, which has helped spread the word. I think that’s because we have a compelling story to tell at Figure 1. Paging connects healthcare professionals with verified specialists to give fast feedback on a case. It’s probably our biggest feature update yet, and we’re excited by how it allows people to connect across institutions, countries, and borders at any moment. We actually made a video about it here. Any other new developments in the pipeline? We’ve now expanded to more than 100 countries, but there’s still work to be done on this front – including expansions to most of Africa and Asia. We’ll also be working on refining paging and making sure it’s the most useful feature it can be. You joined an incubator early in the product development process – what was your assessment of the accelerator experience? An incubator like the DMZ can provide structure to a young team that hasn’t developed its own culture yet. Because I come from a medical background, the routine meeting with our advisors helped me learn more about business goals and strategy. Overall, it was a great place to start, and they’ve continued to be very supportive. When is the right time for a startup to join an incubator? I think joining an incubator is best for startups that are at a very early stage – perhaps while refining the minimum viable product. Incubators excel at delivering fast feedback and helping to develop a workplace culture, but at a point, it becomes more sensible to have a dedicated office. Is an incubator appropriate for all startups? Similarly with investors, each incubator has its own values and goals. Ensuring a good fit, especially at such an early and vulnerable time, is extremely important. Don’t be afraid to visit before making a commitment. Unclear what is the difference between an accelerator and an incubator? So was I! Click here for an interesting article outlining the differences.